Tracy, CA– Across all three divisions, the teams that earned bids with their regular season performance kept them at Southwest Regionals. With three bids up for grabs in the women’s division of the Southwest this season, there was not much tension to be had in Tracy, CA. The top three teams–Fury, Nightlock, and Wildfire– were quite clearly a cut above the rest and earned their bids with ease. After Saturday, it looked like the mixed division was well on the way to delivering the upsets it’s so known for, particularly in the talented Southwest. But things got back on track on Sunday, with a resurgent performance from Mischief to win the region, and strong efforts from both Polar Bears and Blackbird to advance. In the men’s division, Revolver Revolver’d. From their first game of the tournament, it was clear that #2 San Francisco Fury was going to sweep. The presiding national champions went through the weekend with ruthless efficiency. Their competition managed to score a combined total of ten points during pool play, and a full 22 points all weekend. Their games against Nightlock and Wildfire were lessons in humility for the two bid-earning squads, and both games were pretty much over by halftime. San Francisco’s depth really was their strength. No single player had to carry the team at any point during Regionals and it seemed as if each player had at least one standout play over the course of their six games. Sarah Griffith was as effective as expected, even if it did seem like the Fury handlers forced a few throws her way at times. The best game of the weekend surprisingly did not feature the best team, but rather the two other Nationals-bound squads: #17 San Diego Wildfire and #7 San Francisco Nightlock. After choosing to start on offense, Wildfire showed how far their handler core has come since the beginning of the season. Lindsey Lang, Kelli Iwamoto, and Hani Pajela moved the disc around the Nightlock defense with ease. The same could not be said of Nightlock’s offense. Their third pass of the game glanced off of Kimberly Long’s hands and gave Wildfire an early break chance. Even after regaining the disc, Adrienne Lemberger lofted out a huck to Claire Sharman that trailed out-of-bounds. Sharman helped return the disc to Nightlock’s possession and Manisha Daryani eventually scored the point, but Nightlock looked out of sync. Their offensive struggles came back to haunt them a few points later. With the game on serve, and Wildfire up 4-3, Nightlock got the disc on Wildfire’s goal line, needing only one short pass to score. That pass was just a little too long. Angela Aie could not reel it in. Wildfire had the full field to go, but Nightlock’s offense was wearing down. All season, Wildfire had struggled to convert on break chances and Nightlock was stronger than many of the teams they had previously faced. If Wildfire remembered this fact, they certainly didn’t show it. The disc moved down the field with incredible patience and poise from the San Diegans. Eventually a high around backhand from Rayna Wachs found Dena Elimelech in the endzone and Wildfire scored the first break of the game to go up 5-3. That break seemed to awaken the killer instinct in Nightlock’s offense. During the proceeding point, Claire Sharman turned on the jets and found a quick goal for Nightlock by torching her defender to score off a breakside huck. Nightlock scored the next point, too, when what appeared to be an overthrown huck from Shayla Harris was saved by a full extension layout from Michelle McGhee. Less than two minutes later, Marisa Rafter capitalized on a Wildfire turn to launch a huck to Iris Leung in the endzone, putting Nightlock up a break. With Nightlock elevating their game to the next level, Wildfire was forced to match it. After a few holds from both teams, Brittany Cabriales perfectly picked off a casual swing from Nightlock’s handlers. Nightlock would get the disc back, but a smart poachy zone allowed Caitlin O’Bara to make a similar defensive read a few throws later. Wachs made a beeline for the endzone and Wildfire broke back to put the game on serve, 7-6. From that point, the two teams traded until half, and traded points out of half, too. Both teams had break chances, but simply couldn’t convert. It would take Manisha Daryani moving to Nightlock’s defense to give them a viable chance to take the lead. With the game tied at nines, Daryani reached over Stephanie Pritchard for a crucial block. She then set her sights downfield, to find Sharman eating up yards towards the endzone. That was all she needed to fire off a deep huck which Sharman caught in stride. Going up one break put enough pressure on Wildfire’s offense that they started to rush the disc and make more mistakes. Rafter set up a smart defensive block at 11-10 and gave Nightlock the chance to break again. She then unleashed a full field huck to Megan Pera, who hit Kira Lou for the break. This would be enough to close out the game for Nightlock. Wildfire couldn’t come back from the deficit despite their best efforts and the game ended 15-13. Even with a loss, this game must have been encouraging for Wildfire, as the team has struggled against teams of Nightlock’s caliber this season. If they can bring this same offensive efficiency to Nationals, they could exceed expectations. As for Nightlock, the most important score of their tournament was their 15-7 loss to Fury. Nightlock seems destined for a quarterfinals appearance but needs to do more against teams like Fury if they want to advance past that. #25 Oakland LOL put up competitive games against Nightlock and Wildlife, even if they fell well short of winning those matches. LOL’s problems mainly stemmed from getting the disc back on offense after making a mistake. The team has an abundance of talented throwers and savvy veterans, but needs some younger athletes to complement the core of their roster. Bay Area FAB ended their weekend with a 4-3 record, handily beating a number of Southwest women’s teams to earn those wins. FAB is a younger roster that could develop some players into mainstays of the Southwest division. For a first-year team, Los Angeles Rampage had a very successful tournament. Players like Alyssa Perez, Camille Wilson, and Malia Smith have a high upside that could help the young LA team become competitive sooner than not. By now the Southwest earning only one bid has become a running gag; a tale as old as time. And while this led to one of the most exciting college Regional finals we’ve had in a while, the same thrill is not felt in the club division. #2 San Francisco Revolver is very much to blame for this problem. Their reputation, ability, and on-field presence is so commanding that there was an air of inevitability all weekend. Even losing key players like Ashlin Joye, Byron Liu, Nick Stuart, and Joel Schlachet for large portions of this weekend couldn’t dull their shine. Revolver finished the weekend with only one team posting double-digit points in the six games they played. The Bay Area team may have stumbled at times this season, but Regionals was a helpful reminder that they are still the most dominant men’s team since NYNY in the early nineties. In the final, Revolver didn’t take any time to get going. After an early hold from the #10 SoCal Condors that required an emphatic layout grab from Sean Ham, Revolver quickly punched in a goal of their own after a deep cut from Davis. The very next point, John Stubbs skied Travis Dunn for Revolver’s first break chance. The Condors did all they could to get the disc back but it wasn’t enough, Revolver broke on the third point of the game. From there, all the pressure fell on the Condors. While they managed to trade holds for the next few points, it was fairly clear that the Revolver defense was on another level compared to what the Condors could muster. The turns for Revolver’s offense were few and far between, and they always got the disc back. The combination of Grant Lindsley, Simon Higgins, Antoine Davis, and Marcelo Sanchez downfield just gave them too many available targets. The Condors just did not have the athletes to deny all four of those cutters on any given point. Nevertheless, the Condors offense kept the game competitive until half. All of Revolver’s pressure had only earned them one break in the first half, and the Condors had earned a few turns of their own during that time. Revolver started the second half on offense, up 8-7. Within a few short passes, they had worked the disc to the front of the endzone before a remarkable full extension block from Scott Radlauer denied Lindsley an easy goal. Alas, the Condors forced a huck to McDougall that he could not reel in. With the full field to go, Revolver set up an iso for Davis and he struck deep immediately. Cohen gave chase but knew he was beaten from the get-go. That same play would be used to earn Revolver another goal just two points later. From there Revolver took over and snagged two more breaks to go up by three points. Dom Leggio and Travis Dunn kept the Condors in contention but it was clear that it would take a miracle for them to win the game. That miracle never came. With Revolver leading 14-11, Higgins caused his defender to commit his hips to the undercut and gave him a full four-yard advantage on his deep cut. That was all he needed to score the goal and and the game. 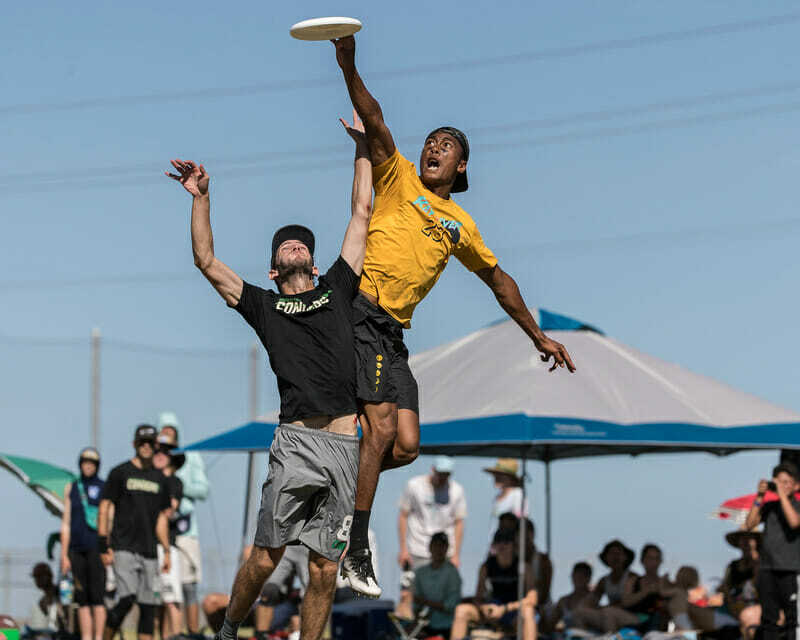 This weekend may have reinforced Revolver’s dominance in the men’s division, but it was also a vivid reminder that the Condors deserved a spot at Nationals1. The SoCal team proved in semis that their offense was a level above Guerrilla’s and proved in the final that they could hang with one of the best men’s teams ever assembled. Players like Travis Dunn, Hunter Corbett, and Sean Ham made even the toughest defenders seem juvenile at times. When the Condor’s offense was in rhythm, no defense was stopping them. With only one bid on the line, their game against Revolver shone a spotlight on their weaknesses. The Condor’s were a well-drilled team, but didn’t have an answer to Revolver’s best downfield athletes. They tried a number of different poachy and junk defenses, but nothing was slowing Revolver when they were on a roll. Even when Revolver did cough up the disc, the Condors couldn’t gain any traction. Too often they threw up a 50/50 shot or made a wide pass that sailed out of bounds. The same players that had carried them to the final of the Elite-Select Challenge were picked apart by Revolver time and again. Still, the 11 points that they scored on Revolver should be a badge of honor for the Condors offensive unit. If last year is any indication, there will be many teams at Nationals that never make it that close. The weekend may not have ended as #20 Oakland Guerrilla had hoped, but it was still a strong showing from the Oakland squad. Their losses against Revolver and the Condors were not an indictment of the team so much as a reminder of the strength of the Southwest division. When it gets right down to it, Guerrilla’s pace was what sunk them against both teams. The same energy and speed that helped them destroy weaker teams flipped against them when they played the two other elite teams in Tracy. Their risky shots didn’t end in their favor when matched with athletes who could apply pressure on every pass. In both games –but particularly against Revolver– Guerrilla fired out multiple shots that sailed beyond the back of the endzone. That’s not to say that Guerrilla looked bad this weekend. Their younger players, including Dillon Whited, Caleb Merriam, and Jack Hamner, all played substantial roles for the team and could carry the team for years to come. The rest of the tournament was rounded out by young, promising teams on the rise. San Diego Streetgang, despite going through a rebuilding phase this season, ended the tournament with their best results in years. Their offense relied heavily on returning veterans, but their young defense showed promising potential. They relied heavily on players like Zachary Spidell, Reggie Sung, and Mark Slader to make plays after the turn. Moving Trevor Purdy to their D-line also gave them a release valve when they desperately needed a break. Los Angeles Doggpound had some flashes of brilliance, too. The team had a number of L.A. Aviators on their roster. Each and every one was overshadowed by Daniel Landesman. The seventeen-year-old is fast becoming one of the most well-rounded high school players in the nation. In an unfilmed game between Doggpound and Streetgang, Daniel Landesman had one of the filthiest skies of the tournament. Antoine Davis’ performance in the final of Regionals certainly lends credence to the claim that he’s the fastest man in ultimate. #11 San Francisco Mischief’s weekend can be explained with a simple– no, wait… Never mind. Despite ending the tournament as the overall victors, Mischief took the scenic route to the final. After a solid opening performance against a diminished Santa Barbara Robots team, Mischief proceeded to lay an egg against Phoenix Rubix. The team from Arizona came out with something to prove and rallied from a slow start to beat Mischief on double game point. It’s not as if Mischief wasn’t trying to win the game, either. They threw out their best lines. Careless turnovers and forced hucks were what eventually caused them to crumble. Under normal circumstances, this loss would be enough to light a fire under Mischief’s offense. Instead, the Bay Area team stumbled again against BW Ultimate, a team that they handily beat at Sectionals. To BW’s credit, the team stomped on the gas pedal early and dictated the tone and pace of the game from the first point. Where Mischief was shorting their throws, BW was hitting their receivers dead-on. The lead fluctuated at times, but it was clear that BW was in the right state of mind to beat Mischief. And they did. By the end of pool play, Mischief was 1-2 and narrowly made prequarters. This had to be discouraging for Cutthroat, Mischief’s final opponent on Saturday. Cutthroat did everything right to earn the second seed in their pool and were rewarded with Mischief in a do-or-die situation. Things continued to get worse for them as the game progressed. Mischief bageled Cutthroat in the first half and eventually won out 13-3. With their cards on the table, Mischief remembered who they were and what their full potential could be. The second half of Mischief’s tournament was completely different from the first. With Blackbird losing a tight game against Polar Bears on Saturday, they fell into quarters against their old friends and bitter rivals. Two weeks prior, Blackbird had roasted Mischief at Sectionals, ending the game 13-5. And yet, with everything on the line, Mischief came out to play. They stormed into the game and took half 7-3. Blackbird’s first half strategy of relying on Mac Taylor to get things started wasn’t working. Fortunately for them, Barrs Lang took over in the second half. Blackbird earned two straight breaks out of half and kept clawing back into the game from that point forward. With the game tied at 11-11, Mischief’s women took over and helped them beat Blackbird for the first time all season. This set them up for a rematch against BW Ultimate and they would not make the same mistakes twice. Where BW had once outplayed Mischief deep, Mischief now ruled the sky and came down with everything. Most importantly, Mischief managed to pressure BW handlers into making some poor reset passes. With their renewed defensive intensity, Mischief cruised past BW 13-5 and earned their spot in the final against the unbeaten Polar Bears. The young #12 San Francisco Polar Bears squad came out hot, but cooled off quickly. Both teams had a number of unforced errors in the first half and it bogged down the game considerably. This worked in Mischief’s favor. Where the Polar Bears had efficiently taken care of business all weekend, Mischief had been playing scrappy since Saturday. They fought for every possible advantage and took an early lead, which they held until the game ended. This may not have been the most dominant showing that Mischief has ever had at Regionals, but it may be their most memorable. Before Regionals started, the question on everyone’s mind was whether any team could knock off one of the three bid earners. After day one, Mischief seemed like the most fallible for sure. In fact, by the time the dust settled, of the three teams, only Mischief had losses to any team outside of the top three. The Polar Bears’ only loss came in the final at the hands of a resurgent Mischief squad. The rest of their weekend was defined by brilliant performances from every player on their roster. On their O-line, Margo Stert looked particularly impressive in their tougher games, and transitioning Daniel Naruo to a more active downfield role worked heavily in their favor. The true standouts were on their defense, though. Players like Bob Madden and Joe Thompson were largely responsible for their wins over Blackbird and Classy. Blackbird might leave this tournament upset, but they should not feel discouraged. The team suffered two losses this weekend, both on double game point. With the slightest variance, this team could have come away with a clean sweep. This is largely due to the strength of their offense. Mac Taylor is as unstoppable as ever, and is joined by players like Malina Wiebe, Molly Hallweaver, and Ryo Kawaoka. Mischief may have won the tournament, and the Polar Bears may have the best record from the weekend, but Blackbird may outperform them both come Nationals. BW and Classy both had exceptional games and must be happy with their tournament. Both teams seemed like real contenders for the third bid. Of the teams from SoCal, Los Angeles 7 Figures was the only one that made bracket play. This was made all the more impressive considering the players they were missing on Saturday, which included three of their captains. The Bay Area Donuts broke seed in a massive way. They came in as the no. 16 seed and left the tournament ranked 7th. Comments on "Southwest Regionals 2018 Recap: Mischief’s Sunday Bounceback, Bid-Earners Claim Their Reward"